1. It is back to the grind after the holiday weekend! 2. The Orioles have been playing less than spectacular baseball, but with the signature win yesterday they are only one game out of first place. Ready to make a run. 3. Congrats to the U.S. Women's Soccer Team for bringing home the World Cup! 4. It is July and vacation time--I wish I was headed off on vacation today. 5. 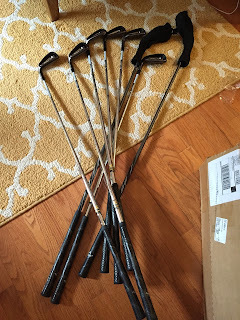 My new golf iron set arrived three days early--they still haven't been broken in yet. The Callway Razr XF's are ready to take to the links. Someone remarked, "Oh that's too bad, they're backwards." Maybe that's why I got such a good deal on them. 6. How about the Greeks--they are going to send the entire world economy into a tailspin! 7. In response to the furor over the Confederate Flag, it was reported that Bubba Watson, a two time golf Master's winner will paint over the flag on the General Lee--one of the original cars for the Dukes of Hazard TV series. 8. Have a great first full week of July! I wish I was in Florida.